Alldress Absorbent Film Dressing, by Molnlycke Healthcare, is one of the more diverse adhesive dressing that can treat mild to moderately exudating wounds directly. It can also be as a secondary dressing to back another non-adhesive absorbent underneath. 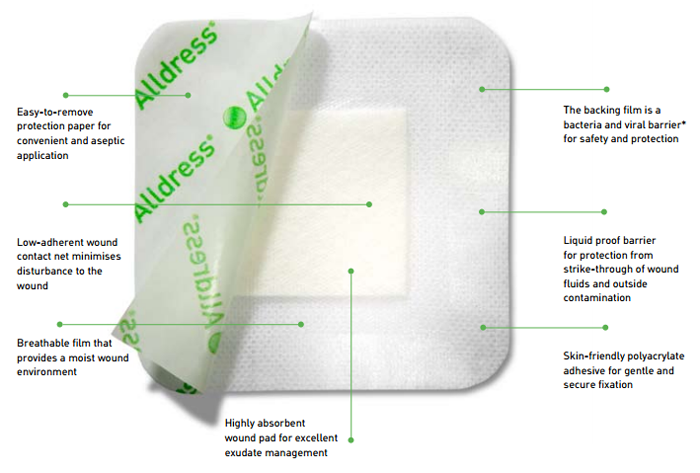 The Alldress wound absorbers are made with their own adhesive edges that go on the skin securely, yet peel off gently to minimize any irritation to the skin. The backing film provides a moist wound environment while protecting the skin from outside contamination. 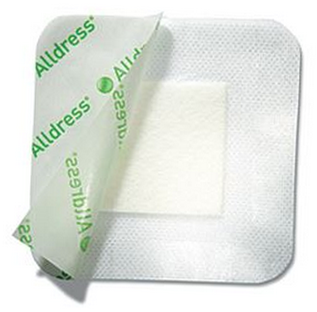 These absorbent dressings have a material that will wick away exudate and distribute it through the soaking material. The user will see the exudate through the top of the bandage as it accumulates. The backing will keep the exudate from oozing through, while the border adhesive will keep it all contained. This will effectively minimize the risk of maceration to the surrounding skin. 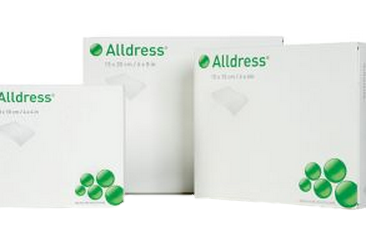 Alldress is made of polyurethane film and polyester non-woven laminate, coated with polyacrylate adhesive. This is all to keep the dressing smooth and as flush with the skin as possible to prevent hang-ups or snags on clothing. It will reduce the amount of sheer force in case the wound rubs repeatedly against something. When taking the bandage off, the low-adhering polyolefin net will minimize pain and keep the material from sticking to the wound. It includes a low-adhering wound contact net minimizes disturbance to the wound. The backing will protect the wound from microorganisms. The dressings have their own adhesive so no tape or secondary adhesive is needed. The dressing maintains a moist wound environment, ideal for healing.